Barefoot Gallery with Paths to the Peak on a quiet Wednesday evening. The Paths to the Peak exhibition ran for two successful weeks at the Barefoot Gallery with a finish on June 5th.The arrangement and choices of images was greatly assisted by the keen eyes of Sebastian Posingis and Dominic Sansoni of Three Blind Men. Their office with Rukshan Jayewardene is directly above the Gallery and they were on hand during the whole process to give feedback on the setup. Laying out the actual frames was facilitated by the able talents of Jayatissa and Chandrashekra who are wizards with lining up and placing frames. Nazreen Sansoni and her assistant Rasika provided support and logistics from the Barefoot Gallery and it was a team effort. I designed and printed a 34-page exhibition catalog with Softwave (available at the Barefoot Bookshop). The exhibition featured 41 images and two A1 posters with write-ups on the landscape and ecology of Sri Pada (the culture poster never quite made it). 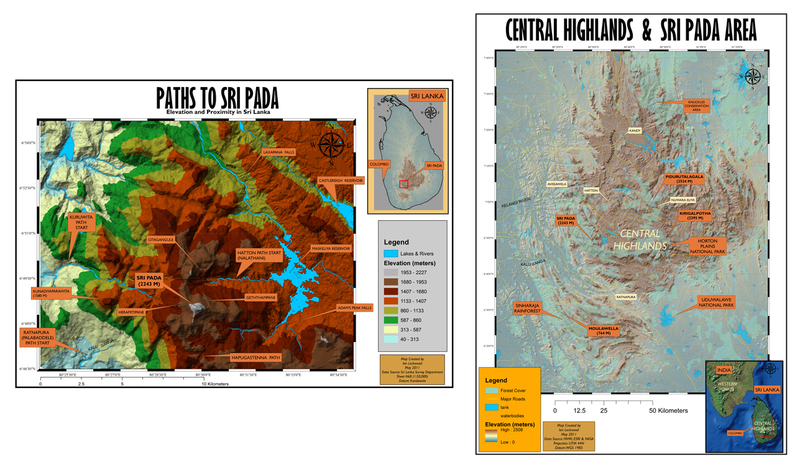 There were also two A1 size maps that I made using ArcMap 10 (see below). 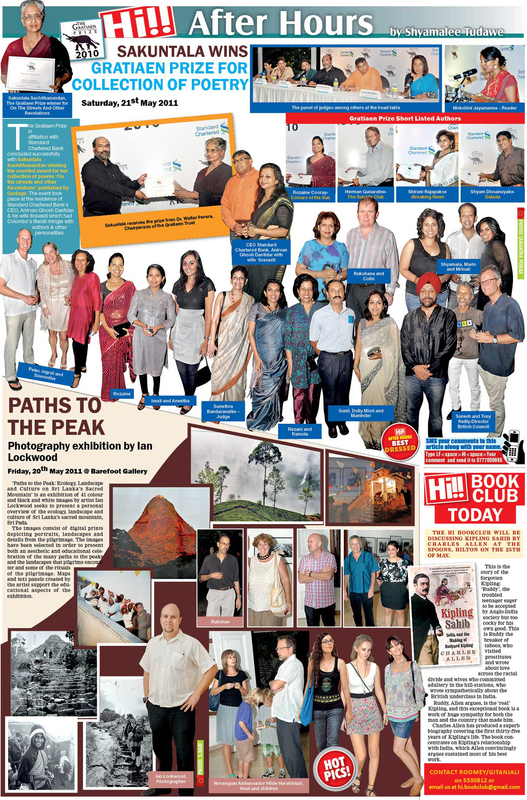 During this time the exhibition attracted positive coverage from the Sri Lankan press. There were reviews in the Daily News. Malaka Rodrigo, who I know through Field Ornithology Group, wrote an appreciative review in the Sunday Times. He has climbed the peak 18 times so it was gratifying to receive his endorsement. Shabna Cader had a conversation with me on the opening day and wrote up an article for The Nation. The opening was covered in the Daily Mirror in their gossip page (see below). R.K. Radhakrishnan from the Hindu came by and we had a chat about the show and the less visible links of the Sri Pada work to my previous efforts on the Western Ghats. His review emphasizes the trans-boundary aspect of the exhibition. Frontline ran a series of pictures and my essay from the Catalog at the same time that the show was up. I have placed several of the exhibition highlights in a Gallery on the High Range Photography site.